Cheshire Cat Photo Blog (… said the Cat: 'we're all mad here….') 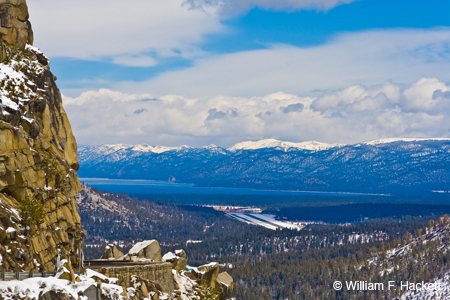 » Blog Archive » Lake Tahoe got 6.4 billion gallons of water in 24 hours! Lake Tahoe (one of my images is above), at roughly 6,223 feet of elevation, is the second deepest lake in the United States, after Crater Lake in Oregon. This summer, many boaters were unable to get their craft into the water, because the very low lake level pulled the water back from most boat launches. The rains and snows this week added 1.92 inches to the level of Lake Tahoe, which translates to 6.39 BILLION gallons of water, according to the National Weather Service, as reported by SFGate.com. The storms this week added about 3 feet of wet, heavy snow to the area. Another storm, from the north and with less moisture, is scheduled to hit the Bay Area, and then the mountains, tomorrow! TV news reports that, although some ski slopes in the eastern U.S. have not been able to open this year, other slopes in the WESTERN U.S. have had to close temporarily as the result of avalanche danger from all the snow! "Lake Tahoe got 6.4 billion gallons of water in 24 hours!" was written on December 23rd, 2015 by Bill, and filed under California,Photography,Uncategorized. Next: Karma: Act II, Scene 1- Martin Shkreli’s former company IMPLODES!